Enjoy Tuition Discounts -- an Opportunity for You; an Opportunity for the U.S. Navy. It is our hope that this scholarship will encourage you and your dependents to pursue higher education goals and become more effective contributors and leaders. Learn more about our specific partnership programs: Great Lakes Naval Station and Recruit Training Command Scholarship. In addition to a variety of delivery options, Lewis University also provides many academic support services including: academic advising, library services, career services, computing labs, and academic support services to help adult students succeed academically. Active Duty service members (and their dependents) of Great Lakes Naval Station, affiliates, or Recruit Training Command are eligible to apply. Great Lakes Naval Station and Recruit Training Command duty location verification by Great Lakes Naval Station Education Center must be provided. May not be used in combination with other Lewis University Grant, Merit/Academic Scholarship or tuition discount programs. 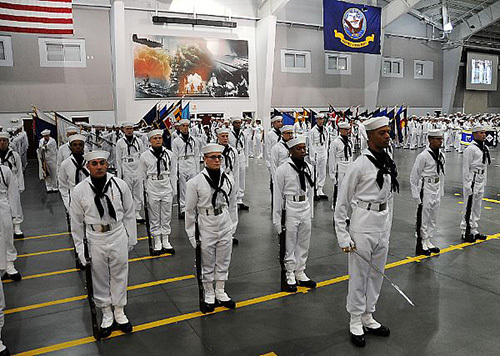 A “Great Lakes Naval Station and Recruit Training Command Scholarship for Active Duty and Dependents Tuition Discount Application” form should be submitted prior to starting classes. Lewis reserves the right to cap the number of recipients in any given semester. Lewis reserves the right to halt the commencement of a class prior to its start. Submit the corresponding "Employee Discount Form" to the Great Lakes Navy College Office for approval.